Smokey Bear (image by Multnomah Falls Lodge). 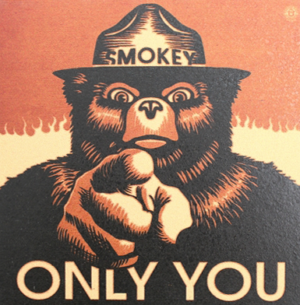 “Only YOU can prevent forest fires!” Smokey Bear began bellowing his evergreen slogan in 1947. The blue jeans wearing, shovel toting, bear-turned-park ranger has been the official mascot of fire suppression for over 70 years now. Smokey’s message had good intentions: practice responsible fire safety measures. The commercials featuring Smokey, however, told a different tale. Black and white cartoons broadcasted the message that forests are responsible for everything from the water you drink to the food on your plate. One errant fire and it all disappears, cuddly critters included. Decades of this type of marketing lead to a common misconception: forest fires are detrimental and must be prevented at all costs. The reality is that forests depend on fires to remain healthy. Fires provide many benefits to a forest’s health. Fires instantly return nutrients to the soil that was previously locked away in dead organic matter that may have taken decades to decay. Much like a fever, the heat from fires also cleanse the forest of many harmful bacteria and viruses. 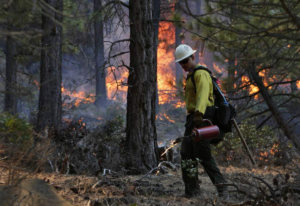 Fires support healthy watersheds, and yes, Smokey, that means the water that you drink. 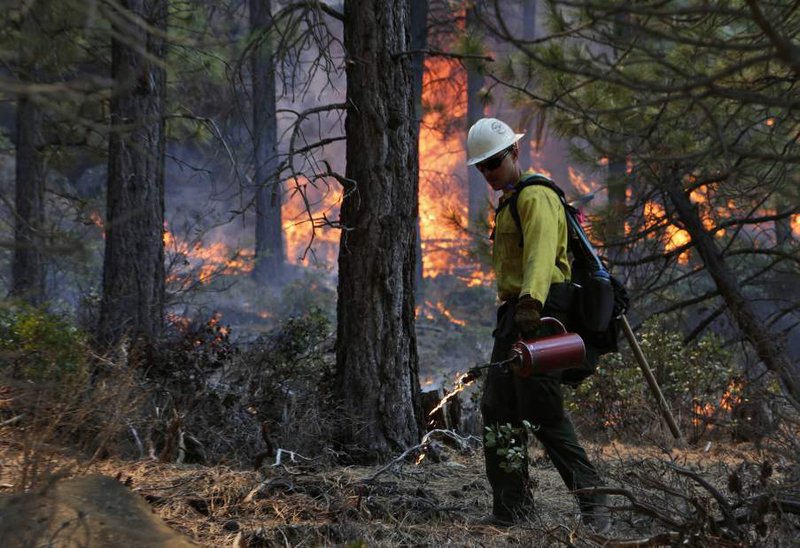 Ryan Andrade, a member of the Redmond Hot Shots ignites brush while helping start a prescribed burn in Deschutes National Forest land west of Bend in 2017 (photo by Joe Kline/Bend Bulletin). It wasn’t just the drinking water that Smokey got wrong. By aggressively preventing wildfires, we’ve also, ironically, made them more dangerous. When fires burn often, fuels have less time to accumulate between fires. Frequent, smaller fires are much more manageable. They’re less likely to become out of control, dangerous conflagrations, and are better for the forest’s health. Because of this, wildfire experts agree that the best practice is an aggressive “prescribed” burn schedule in which fires are intentionally started and monitored. This allows forest managers to make sure all fires are safe because they can control the conditions under which they are started. They can not only make sure the burns don’t become out of control, but they can also plan prescribed burns around wind conditions that will make air quality impacts much less substantial. Instead of adopting expert-recommended prescribed burning as a staple of forest management, many land managers opt to “thin” forests by allowing timber companies to cut down large mature and even old-growth trees under the guides of reducing wildfire risk. Removing older trees, which often times survive wildfire due to their size and thick bark, does nothing for fire prevention. It is a profit-driven management practice, and a lucrative one at that. The persisting practice of logging in place of burning has led to some of the most matchbox forest conditions we’ve ever observed. These conditions coupled with climate change and more homes being built nestled inside these matchboxes makes for a tragedy that writes itself. Experts agree that if we are to live in heavily forested areas, we need to start planning our structures around forest fires. Fire shelters need to be as common as the tornado-safe basements that are ubiquitous in the Midwest. Roads, which also work as fire barriers, need to be built with wildfires in mind. Homes need to be built out of fire-resistant materials. Enough space needs to be between structures to keep them from spreading to one another. California Governor Jerry Brown described conflagrations like the recent Camp Fire that ravaged the town of Paradise as “the new abnormal.” Until we can fix our forest management practices, how we design our structures, and mitigate the effects of climate change, he just might be right. Until then, maybe it’s time to update our old Smokey Bear message. Instead of preventing forest fires, let’s leave them up to the experts.